I must have read it many times before, but have no record of ever preaching on it. Colossians 1: 1-14 (set for the 2nd Service in today’s lectionary) was our chosen reading for All Age Worship this morning. It’s fascinating – one of Paul’s amazing prayers for fledgling Christians and the fledgling church. The underlying theme is ‘bearing fruit’ – the Gospel has taken root in their lives. Now, he says, you have the power either to stifle that growth, or let the Word grow and develop among you, to do who knows what. His prayer is that they might have knowledge, power, strength, patience and joy. So we prayed this morning that we would bear fruit this year. The fruit of prayer for each other and for our commuunity and world. The fruit of knowing God and experiencing God’s power. 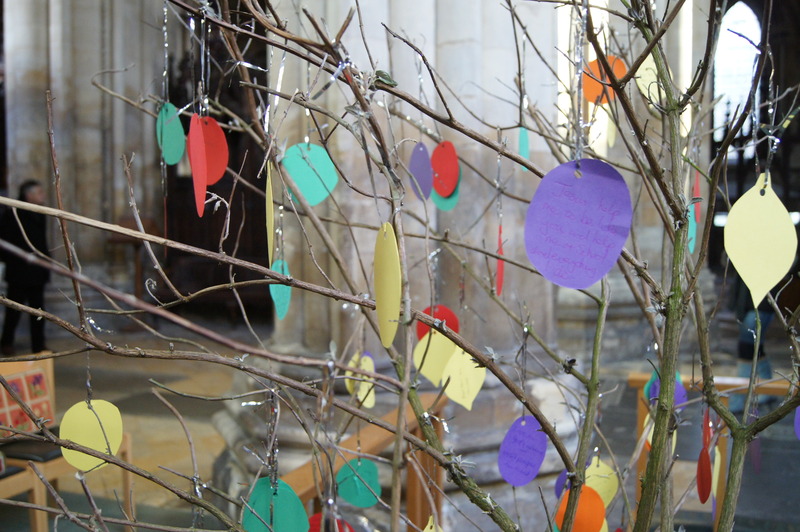 People wrote their prayers on fruit, and this tree will now be in our prayer chapel, as a sign of our thankfulness to God for planying his Word in us, and our determination to let that seed grow as well as we can make it. Here’s to being fruity in 2011. You are currently reading Photos for the 12 Days – IX at Jeremy Fletcher's Blog.